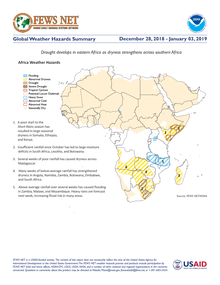 Significantly below average rainfall since October has caused significant dryness in southern Africa. Dry spells continue in Namibia and Angola. Below-average rainfall since November has caused drought in South Africa, though there has been recent moisture improvement. 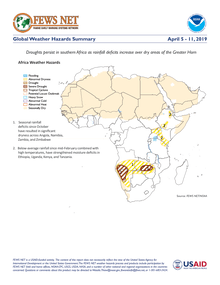 Significantly below average rainfall since October has resulted in extended dry spells in southern Africa. Improved seasonal rainfall in February has brought relief to many areas in South Africa. Heavy rainfall is forecast over Madagascar next week with the potential for flooding. Significantly below average and infrequent rainfall since October has caused widespread dryness in southern Africa. 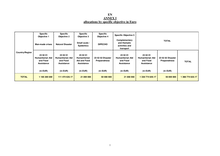 Improved seasonal rainfall since December has brought relief to many affected areas. Heavy rainfall is forecast over Malawi, Mozambique, and Madagascar with the potential for flooding. 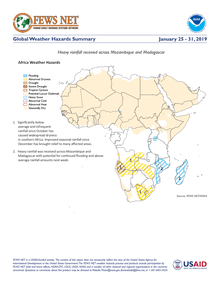 Heavy rainfall is forecast for Mozambique and Madagascar with potential for continued flooding. Heavy rainfall was received across Mozambique and Madagascar with potential for continued flooding and above-averaga rainfall amounts next week. Continued below average rainfall since October has resulted in widespread dryness throughout southern Africa. Poor rainfall has led to anomalous dryness across Madagascar. Heavy rainfall forecast later this month is expected to provide relief. An erratic rainfall distribution since the Short-Rains season has caused large seasonal dryness in Somalia, Ethiopia, and Kenya. 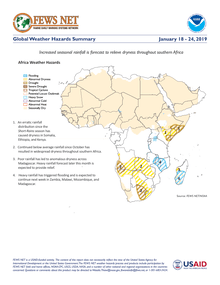 Continued below average rainfall since October has resulted in significant moisture deficits throughout southern Africa. Several consecutive weeks of poor rainfall has led to anomalous dryness across Madagascar. A poor start to the Short-Rains season has resulted in large seasonal dryness in Somalia, Ethiopia, and Kenya. Insufficient rainfall since October has led to large moisture deficits in South Africa, Lesotho, and Botswana. 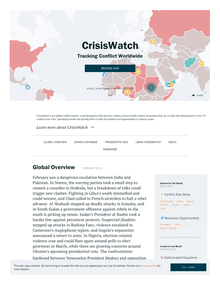 Several weeks of poor rainfall has caused dryness across Madagascar. Many weeks of below-average rainfall has strengthened dryness in Angola, Namibia, Zambia, Botswana, Zimbabwe, and South Africa. 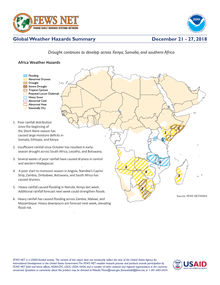 Poor rainfall distribution since the beginning of the Short-Rains season has caused large moisture deficits in Somalia, Ethiopia, and Kenya. Insufficient rainfall since October has resulted in early-season drought across South Africa, Lesotho, and Botswana. Several weeks of poor rainfall have caused dryness in central and western Madagascar.